All the little chocolate flakes are purty. 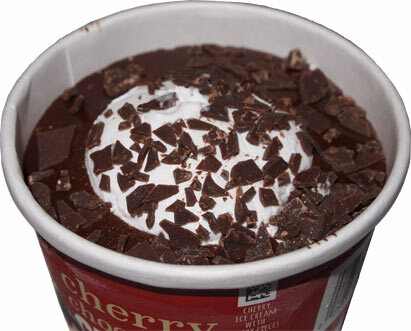 You know, this reminds me that I was going to write a review about their (new for 2014) black cherry ice cream awhile back but it kept getting finished before I could do a proper review... that and there's not always a whole lot to say about black cherry ice cream. Short story long, basically it's a pretty potent beast hiding under the chocolate fudge. It definitely one of those cherry flavors with a lot of bite. But how does the sundae taste you ask? Fudgy, very fudgy. The fudge topping rules all of his domain. Sure, you might get a bit of cherry kick on the end, but overall it's fudge first. 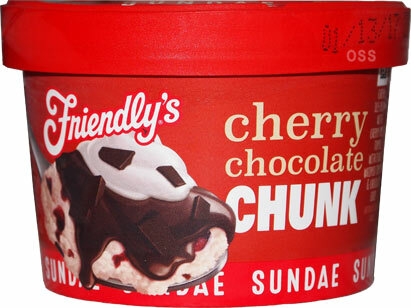 If I could change one thing, I would have used a cherry chocolate chip flavor. The flakes on top are a lot of fun so it would be cool to see them go all the way through. I'm going to call this a smart addition by Friendlys. Their sundae cups are fun IF you remember to let them melt a bit, and now they've rounded out the lineup a bit by adding in another fruit flavor. Buy Again? I'd be too tempted to grab one of the other flavors first. So you do have the patience to let this sit! 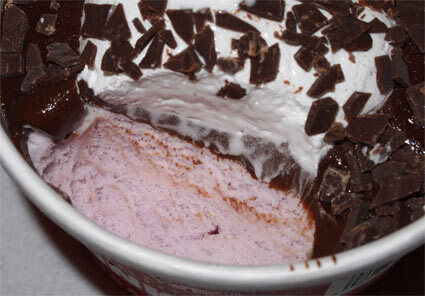 If you could try out the Wattamelon Sundae cup before it ends its Limited Edition run, that'd be great! I've already had the new Chocolate and Caramel "Kake Krunch" flavors--you're not missing anything astounding there. HA! I had it early today but didnt get to cropping the photos. The description on the cup is pretty much how it tastes.